They sat in my book case for a few years… Thomas was born in 2010 and I started to worry that I would be the dad that wanted to build a big project for my boys but leave it too late and they end up all grown up before I get round to it. So 2012 I made a start buying 2 sheets of waterproof 8mm MDF, and glued my A1 sheets to them and jigsaw in hand set about cutting out all the body parts. 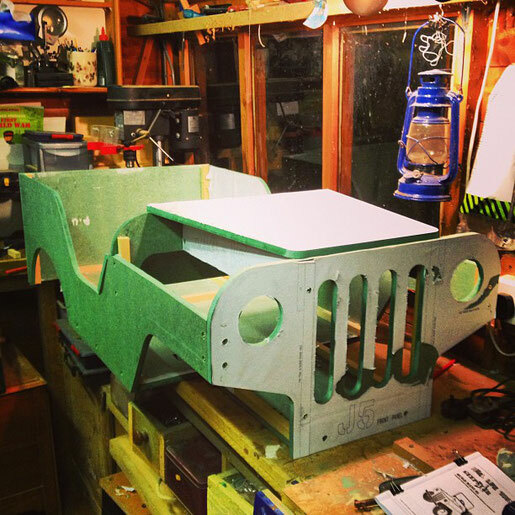 First up was woodworking and assembling the large pile of jeep body panels with glue and screws. It formed into a rigid structure which received a few coats of army green paint. I started to stray off plan at this point when I began looking at the running gear. The kit was intended to have a single 12v motor mounted on one side in the rear driving one rear wheel via chain. It also had a boolean speed control of either on or off. I wanted something better so spent quite a lot of time looking for motors on Ebay. The gods of Ebay were looking down on me and I was lucky to find the perfect solution. I found a transaxle from an American electric ride on lawnmower. Apparently a disaster of a product and one was scrapped for parts in the UK. Next up was welding, and I mocked up a ladder frame chassis from inch square steel tubing. (Another stray away from plan as the original had no chassis and components where screwed direct the MDF body). The transaxle was bolted to the chassis via the pillow bearings and additional bracket added to secure the drum brake. Up front I spent a long while thinking up how to make the stub axels for the front wheels. Many sketches laying out Mechanical Design and much head scratching was rewarded with inspiration while in a hardware shop. Gate hinges bolted together in X, Y and Z planes. These are eye bolts with a hole at one end and M8 threaded rod at the other. 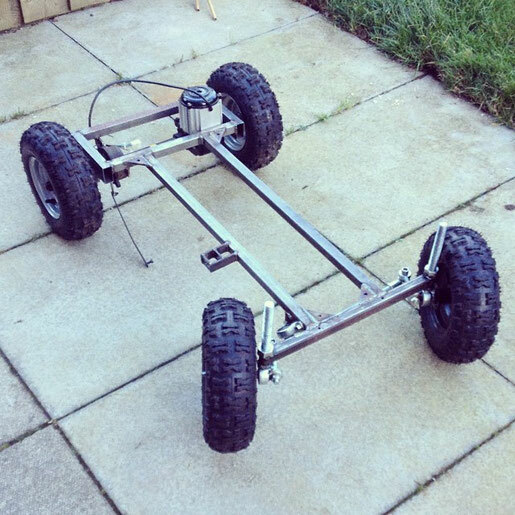 A quick and sturdy solution meant I had somewhere to attach front wheels, and at 90 degrees somewhere to attach to the chassis, and at another 90 degrees was somewhere to attach steering tie rods. For these I used some M8 rose joints with some more M8 threaded rod to keep the front wheels parallel. From here I made a trial fit of the body to the chassis and started to plan the steering column, brake and accelerator pedals. Steering column was an 8mm steel rod mounted to the body at an angle with some more pillow bearings. Threaded rod welded to the top to attach the steering wheel and an angle bracket at the bottom to make the steering functional. For the brake pedal I made a lever that takes forward motion and translates it into reverse movement that then pushes a rod to the lever on the drum brake. On to electrics. As the motor required 36 volts and was a 3 phase with hall effect sensor I found a 350W electric bike speed controller on Ebay that came all the way from China along with instructions in Chinese. A bit of googling and I had a rough idea of what all the wires on the controller did. I needed a throttle pedal, and did not fancy trying to adapt a throttle twist grip from an ebike. I eventually found a 5V throttle pedal from the USA which was floor mounted and perfect for the jeep. Batteries are 3 x 12V 12Ah batteries from a mobility scooter connected in series with fuse and isolation switch with removable key from motorsports company. All electrics and batteries are located in a compartment below the seat which is self contained and only accessible by removing a number of screws. First test was interesting as the speed controller had to learn the configuration of the motor. Pressing the throttle had the motor running in reverse and at constant low speed. By making and breaking the learn wire circuit it stopped the motor and another press on the throttle had it running forward and with variable speed. Yay! a big moment of joy. Charging is taken care of with a mobility scooter charger with a dash mounted connection and switch. It is connected direct to the batteries and when attached and trickle charges the batteries when the jeep is not in use. I wanted to add some lights and a horn so bought a 36V to 12V converter and added headlights, indicator lights, brake lights and a horn with dash mounted switches. With everything put together and working it was time to put a nervous 6 year old in the drivers seat, explain the controls and set him off round the garden. Like a duck to water Jamie was a natural and was soon running round the garden in circles getting faster and faster. It can crawl along really slowly and can achieve a maximum speed of about 5 miles an hour (I have since fitted a bike speedometer to one of the front wheels) which is fast enough. The brake pedal will lock one of the rear wheels via the drum brake if pressed hard. The steering works well and can turn in quite a small space. 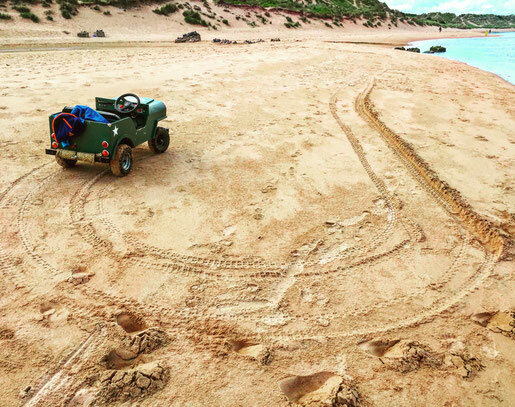 So the jeep has been on the “road” for over 3 years and still gets lots of use. One massive benefit I did not envisage when I set out on the build was for Thomas. 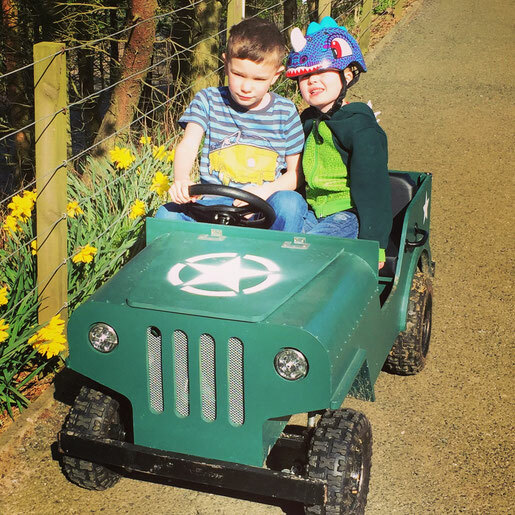 As discussed in other blog posts he was born with Cerebral Palsy and has difficulty walking. So when we go somewhere in accessible for him I load the jeep in the trailer hitch up to my car and take it with us. Its been to Haddo House gardens, Newburgh beach, along the railway track and regularly round our local pond. If we go to a car show or steam fair the jeep comes too and gets lots of looks. Thomas sits in the passenger seat and gets chauffeured around. In tests it will do about 2 miles and can handle almost any terrain it meets. It will spin a wheel rather than stalling. It has a towbar on the rear which tows a garden trailer, and has been used for collecting and moving logs round the garden. It also has a snow plow for the front which is raised and lowered via a linear motor, but that could be a whole other story. 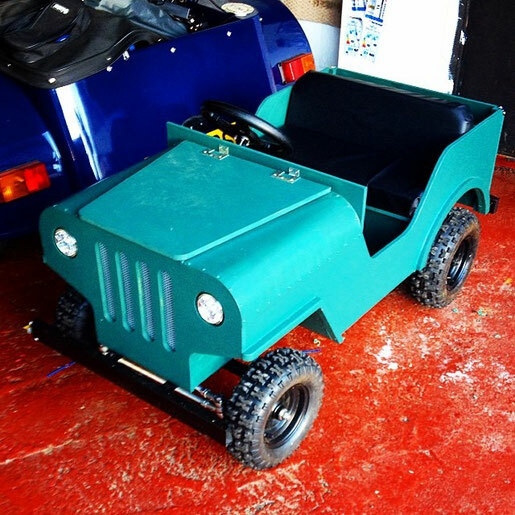 So yea, I have built an electric car. Lots of engineering challenges involved but thoroughly enjoyed it, and am well chuffed that the boys have so much fun playing with it. 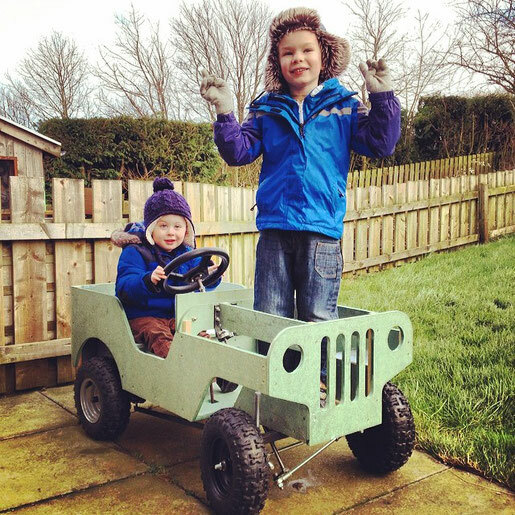 And in years to come both Jamie and Thomas will hopefully have fond memories driving about in the jeep that Dad made. That's a cool project, using skills I never knew you had. i bet your kids friends are very jealous. Bloody fantastic! I think I'll nick these plans from you!